“Maximum discipline and restraint” was the ANC’s assessment of the conduct of opposing factions on the streets of Johannesburg on Monday. A group of about 100 ANC members, under the banner of #OccupyLuthuliHouse, marched to the ANC’s headquarters to voice their dissent over the ANC’s leadership. They quickly learnt how hard it is to challenge President Jacob Zuma as his supporters kept them away from their intended destination, mostly through thuggery. By BHEKI C. SIMELANE. Since the local government elections there have been rumblings of discontent about President Jacob Zuma’s leadership in the ANC. On Monday, about a hundred ANC members decided to demonstrate their frustrations with Zuma and the party’s national executive committee (NEC) through a sit-in at the ANC headquarters. What began as potential war at Beyers Naude Square in Johannesburg was soon silenced. Protesters were confronted with a massive security presence. In front of the ANC headquarters, hundreds of military veterans stood guard while dozens more were scattered around the corner on Beyers Naude Square. They made it clear that they would not allow Luthuli House to be breached and would not accommodate the protesters. The ragtag defence force was presided over by Umkhonto we Sizwe Military Veterans Association head Kebby Maphatsoe and ANC Youth League president Collen Maine, who in media interviews were emphatic of their defence of Zuma and the ANC leadership. When Daily Maverick asked Maine why some in the ANC, like the Youth League, still defended Zuma despite the Constitutional Court judgment which found he had violated his oath of office, he said the president would only be replaced through a national conference. “Zuma cannot step down because some grandstanders want him to. This can only be achievable through a national conference which the youth league patiently awaits,” Maine said. A Zuma supporter, whose name was given only as “Bernie”, said all South Africans needed to forgive the president as he had asked for forgiveness. By forgiving the president, South Africans would be assured he would not commit the same mistakes again. “The election losses should be seen as an eye-opener. Everyone makes mistakes and if one says sorry, they have erred, we must be tolerant. The ANC will not make such mistakes ever again,” she said. Apart from the throngs of veterans’ association personnel, dozens of Johannesburg Metro Police Department (JMPD) and South African Police Service (SAPS) members were deployed in the vicinity. They had their hands full as tensions boiled over between members of the same party. A physical confrontation broke out between the two ANC factions around midday, with the police just managing to separate the groups. The #OccupyLuthuliHouse supporters were outnumbered by the hundreds of pro-Zuma supporters. The Umkhonto we Sizwe Military Veterans Association and Youth League protection force was boosted by Congress of South African Students (Cosas) members, many in school uniform. Cosas secretary-general Khulekani Skosana said they had come to support Zuma. “We want to tell whoever wants to remove President Zuma that it will never happen. Even if they go to the Union Buildings, we will get there first and foil them. We believe in Zuma’s presidency, and no one will stop the president from finishing his term of office,” Skosana said. Maphatsoe said Zuma had instructed them to protect the ANC and that #OccupyLuthuliHouse would be a failure. “In 2012, Zuma said we must protect the ANC from its enemies. The funders of #OccupyLuthuliHouse will never succeed. No one should come to Luthuli House and raise petty issues, they must follow procedure,” Maphatsoe said. The #OccupyLuthuliHouse protesters said that among their demands was that Zuma should step down as ANC leader and as state president. Spokesperson for the group, Sasabona Manganye, said the 80-member ANC NEC also needed to step down. “We are here to occupy Luthuli House. We want the ANC and South Africa’s president Jacob Zuma and the whole ANC NEC to resign while stalwarts are appointed to run the country and guide us to an early national conference. We don’t want the free education commission to investigate the feasibility of free education, we want free education to be implemented. We are also calling for the commission to be dissolved immediately. The free education commission undermines the ANC,” Manganye said. The memorandum of their grievances was received on behalf of the ANC by Secretary-General Gwede Mantashe. It was not the easiest of handovers as many veterans’ association members and pro-Zuma supporters threatened to get hold of it first and burn it. They tried, and almost succeeded. They believed accepting the memorandum legitimised the protest. 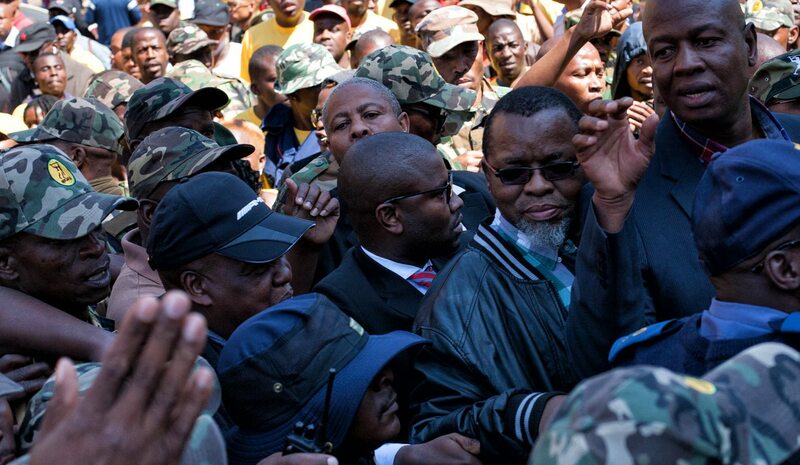 But Mantashe insisted on doing so and tried to dissuade the aggressive veterans’ members from attacking the protesters. When Daily Maverick asked Manganye how #OccupyLuthuliHouse would deal with possible sanctions from the ANC, Manganye said they were ready. Olebile Makompo from the West Rand said he was very disappointed with the ANC’s performance in the recent local government elections and its leadership, and therefore supported the #OccupyLuthuliHouse protest. He said the ANC’s poor performance in the elections was not because failures of municipalities to provide services, but because of the state of leadership. “After such a huge failure in the recent local government elections, the ANC should have recalled Jacob Zuma. The ANC should have recalled Zuma when the Constitutional Court found that he had failed to defend, protect and uphold the Constitution,” he said. Tensions continued after the memorandum was handed over. As the #OccupyLuthuliHouse supporters were led away by Manganye, the other ANC faction aggressively pursued them. But they were not the only ones who bore the brunt of the ANC protection force. Journalists were shoved, sworn at and bullied and some members of the veterans’ association tried to prevent photographers from taking pictures.